Roll over main image to zoom in. Click to open expanded view. This Product Has Limited Exchange Privileges. For support on this product, please contact HONEYWELL MOBILITY @ 800-782-4263. This product is on backorder. Compare similar products? What makes the MX9 an ultra rugged handheld? A host of features including an IP67 rating, 6 feet drop tests to concrete, and the 2,000 cycle 1 meter tumble test make this LXE handheld ready for the most rugged environments imaginable. From built-in heaters for cold environments to brilliant outdoor displays for full-sun environments, the MX9 can handle just about anything. The MX9 is perfect for use in ports and inter modal applications, outdoor logistics operations, cold storage, and any harsh environment where data collection is needed. Don't let it's rugged exterior fool you - the MX9 is intelligent, flexible, and dependable. What makes the MX9 an ultra rugged handheld? A host of features including an IP67 rating, 6 feet drop tests to concrete, and the 2,000 cycle 1 meter tumble test make this LXE handheld ready for the most rugged environments imaginable. From built-in heaters for cold environments to brilliant outdoor displays for full-sun environments, the MX9 can handle just about anything. 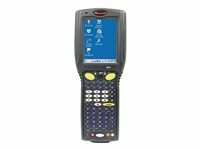 The MX9 is perfect for use in ports and inter modal applications, outdoor logistics operations, cold storage, and any harsh environment where data collection is needed. Don't let it's rugged exterior fool you - the MX9 is intelligent, flexible, and dependable.